Apologetics Press - How Did Noah’s Ark Rest on the Mountains of Ararat? 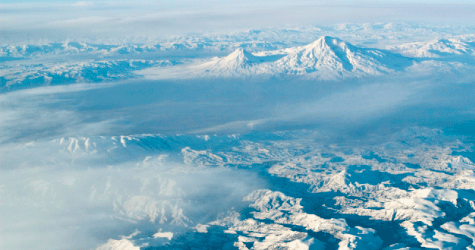 How Did Noah’s Ark Rest on the Mountains of Ararat? In Genesis 8:4, the Bible indicates that Noah’s ark rested “on the mountains of Ararat.” This statement, like so many others in Genesis 6-9, has come under attack by critics. For example, in his two-part article on the Flood, skeptic Dennis McKinsey asked: “How could the Ark have rested upon several mountains at once?” (1983, p. 2). Three months later, McKinsey commented on the passage again, saying, “Gen. 8:4 says ‘mountains,’ plural, not ‘a mountain,’ singular.... Apologists repeatedly say one should read the Bible as one reads a newspaper, which is what I am doing. I assume the book says what it means and means what it says” (1984, p. 3). How could the ark rest on more than one mountain? Time might be put for part of a time period. And the plural can be put for the singular. In Genesis 8:4, the plural obviously was put for the singular. Only a few chapters later this same figure of speech is used again. Sarah asked, “Who would have said to Abraham that Sarah would nurse children? For I have borne him a son in his old age” (Genesis 21:7, emp. added). Anyone who knows much about the history of the Old Testament and the genealogy of Christ knows that Sarah had but one child (Isaac). In certain contexts, however, one might use a synecdoche and speak of one child (as did Sarah) by using the word “children.” Often, when I call for the attention of my two sons and one daughter, I refer to them as “boys and girls.” I actually have only one daughter, but summoning my children with the expressions “boys and girl” or “boys and Shelby,” simply does not flow as well as “boys and girls.” Thus, I frequently use the plural (“girls”) for the singular (“Shelby”). The emphasis is not on the singularity or plurality of the nouns, but on particular categories (“boys” and “girls”). Another apparent example where Bible writers used “the whole for the part” or “the plural for the singular” is found in Matthew 27:44 and Mark 15:32. In these passages, Matthew and Mark claimed that “the robbers” (plural) who were crucified with Christ reviled Him. Luke, however, mentioned that “one of the criminals who were hanged blasphemed” Christ (23:39, emp. added). Luke then went on to document the humble attitude of the penitent thief. So why did Matthew and Mark indicate the “thieves” (plural) reviled Jesus? Although the penitent thief could have reviled Christ earlier, it is feasible that Matthew and Mark were using the plural in place of the singular in their accounts of the thief reviling Christ on the cross. The emphasis, once again, would be on a particular category, and not the number of a noun. Just as other groups reviled Christ (e.g., passers-by [Matthew 27:39], Jewish leaders [Matthew 27:41-43], and soldiers [Luke 23:36]), so did the “robbers” (Matthew 27:44; Mark 15:32)—not necessarily a plurality of robbers, but the category known as “robbers,” which included at least one thief who reviled Christ (Luke 23:39). Dungan, D.R. (1888), Hermeneutics (Delight, AR: Gospel Light, reprint). McKinsey, Dennis (1984), “Letters to the Editor,” Biblical Errancy, p. 3, February. Merriam-Webster Online Dictionary (2008), [On-line], URL: http://www.merriam-webster.com/dictionary.